Michael and I celebrated our anniversary yesterday, and after putting the boys to bed early, I made a special dinner that included these green beans along with a new recipe for maple and black pepper roasted chicken, which was to die for. It’s from a new cookbook that I’m reviewing, so be on the lookout for the full review soon. Sauteing in browned butter is a classic preparation for green beans, and it lends a wonderful nutty flavor. There are many variations on this dish, including using mushrooms or other nuts such as walnuts or hazelnuts. We enjoy it with fresh or frozen haricot verts, although I find that using the frozen kind saves me preparation time, which is quite important when I’m in a hurry to get a meal on the table. The beans are cooked in two steps, first briefly in a pot of boiling water, then after a swim in some icy water to stop the cooking, they are tossed in a mixture of browned butter and shallots, kosher salt, fresh ground black pepper, and toasted slivered almonds. They are tender and flavorful, and if you watch the boiling time carefully, they will not be the least bit mushy. Make sure you watch the butter carefully to prevent burning. I stay right at the stove the whole time the butter is melting and keep a close eye on it, and I will even adjust the heat often, though I’ve found I need to do it more often with this particular cooktop model. 1. In the large pot, bring two quarts of water to boil over high heat. Salt the water and add the green beans. Cook for about 5 minutes. Drain the beans and transfer them to the ice water to stop the cooking process. Drain and set aside. 2. In the large sauté pan, melt the unsalted butter over medium heat, and cook until golden brown, about 5 minutes. 3. Add the shallots and cook, stirring occasionally, until tender, about 5 minutes. 4. Stir in 1 teaspoon of kosher salt and season with fresh black pepper. 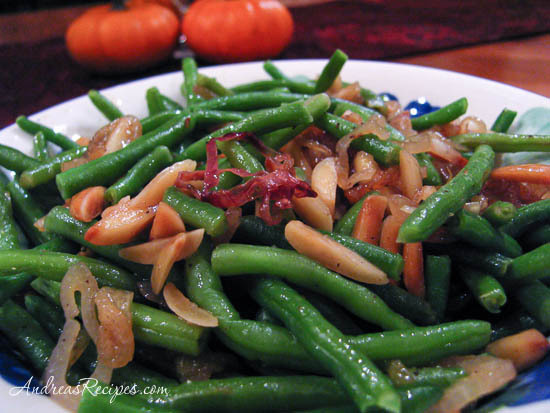 Stir in the green beans and almonds and cook until the beans are warmed through. Taste and adjust the seasonings with salt and pepper. Transfer to a warmed serving bowl and serve immediately. After cooking the shallots, add 4 ounces of wild mushrooms, stemmed and roughly chopped. Cook for about 5 to 7 minutes, then continue with the remaining steps. Happy anniversary Andrea. Those beans sound gorgeous. I often add some toasted flaked almonds, but don’t go the whole hog with brown butter, so will have to try it. Happy anniversary!!! What a sweet celebration. Blessings! Awww, you guys are sweet! Thanks for the good wishes!